Europe en 1100 indiquant la date de la Fondation des Differens Etats. 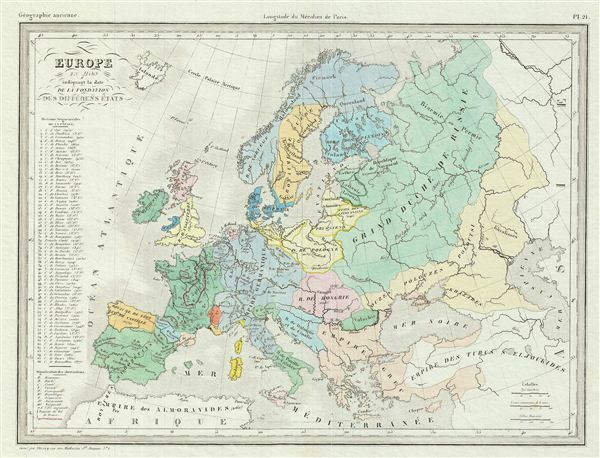 This is a fine example of Conrad Malte-Brun's 1843 map of europe in 1100 AD, showing the date of the foundation of several states. It covers all of europe and parts of Asia during the High Middle Ages and the decline of the Byzantine empire. Various cities, towns, rivers, islands and other topographical details are marked, with relief shown by hachure. The map is color coded according to regions and territories. This map was issued as plate no. 21 in Conrad Malte-Brun's 1843 Precis de la Geographie Universelle.